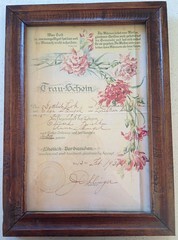 An ordinary document: my grandparents’ marriage certificate. My grandmother’s life was ordinary: she immigrated to Canada as an infant with her parents and older brother, she went to a country school. She worked as a housekeeper and cook; she married, farmed with my grandfather, had two children. Her life is also mythical: her story is – in many ways – the story of Alberta, the story of this country. I know all about the adventures she and her siblings had growing up along the train tracks, and all the trouble they got into on the family’s farm. I know how the men on the threshing crew at the farm where she worked when she was a young adult loved her baking, especially her pies, and told her she should open a bakery. Of course, there is a darker side to this mythology too, one she didn’t talk about. Now, as an adult, I am slowly uncovering more pieces to the puzzle and filling in the gaps of some of those stories. Last month I wrote about finding inspiration in history – and what better place to find it than in my own history? While that is a rhetorical question, I’ve been thinking about the connections between the ordinary and the mythical lately, as my current project – although fiction – touches on my family’s history. I find myself asking other, real questions. Questions I don’t have answers for yet: what do I do with all of these stories? What is my obligation, my responsibility? And: if I am telling these stories, how do I do so in a respectful way – but a way that is also honest and doesn’t shy away from the darker parts of my personal mythology? Natalie Goldberg’s book offers so many gems for writers. This one is so apt for looking at the past in family stories and legends. Best with the venture! Many stories wait untold. Stories are gifts. Just keep writing and get them down. Don’t judge or question your inspiration. Then you can shape the stories for sharing, if you choose. I’m looking forward to reading them because you are a very skilled writer and I enjoy your style and subject. Thanks, Gayle – that’s great advice.